Jesse Owens (D 1980) was an American track and field athlete. He participated in the 1936 Summer Olympics in Berlin, Germany, where he achieved international fame by winning four gold medals: one each in the 100 meters, the 200 meters, the long jump, and as part of the 4x100 meter relay team. 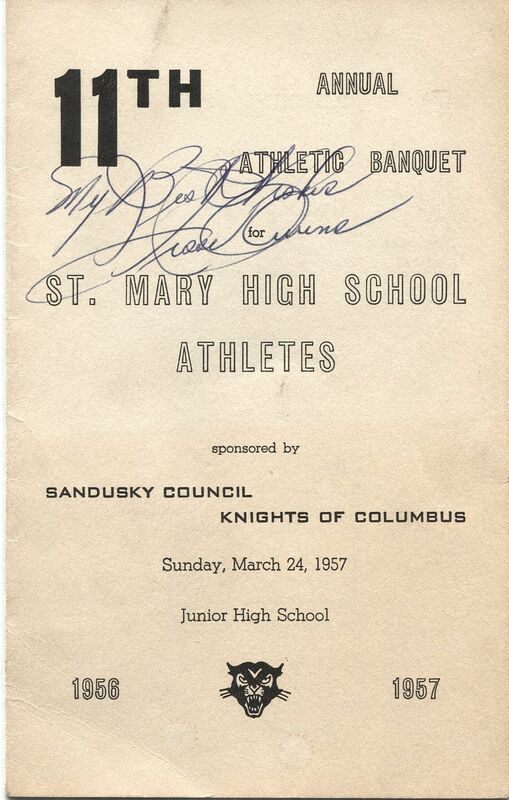 Offered is a 4 page sturdier card stock St. Mary’s High School Sports Banquet Program from 1957 honoring the athletes of this Sandusky, Ohio school. Ohio State legend and Olympic great, Jesse Owens was the keynote speaker. This program measures 5” x 8” and when opened up; measures 10” x 8”. Signed in beautiful ballpoint on the cover by Owens.